Jon Narverud remains unbeaten in goal for Thief River Falls with a 9-0-1 record through 10 starts. Photo by Tim Kolehmainen. The Minnesota Hockey Hub looks to the far northwestern corner of the state for this week’s top game as the top two teams in Section 8A go head-to-head for the first of two meetings this year – and with apologies to Warroad, the Warriors aren’t involved. Having already beaten longtime Section 8A power Warroad at least once each, No. 6A East Grand Forks (12-5-0) and No. 5A Thief River Falls (12-3-1) are now locked in a duel for the No. 1 seed in the upcoming section playoffs (the two teams also get a rematch on Valentine’s night in East Grand Forks). It hasn’t been easy for either program to fight past Warroad, however. Thief River Falls has played Warroad twice – and both games ended in overtime victories for the Prowlers. Back on Dec. 20 in Warroad, Austin Odberg (10-7-17) scored with 1 minute, 34 seconds left in the extra session to give the Prowlers a 3-2 victory. Thief River Falls’ defense was outstanding, limiting the Warriors to just 15 shots on goal. Then in the most recent game on Jan. 19, leading scorer Riley Soderstrom (13-11-24) scored just 16 seconds into overtime to give the Prowlers a 2-1 victory. Again, Warroad had just 18 shots in the rematch. Those games are reflective of most battles between Thief River Falls and Warroad over the past decade. The two programs have met in the Section 8A tournament 10 years in a row, seven times in the section final. No team has scored more than four goals in any of those games and the average score has been Warroad 2.4, Thief River Falls 1.1. It’s been more of the same in the biannual regular season meetings. Senior goaltender Jon Narverud (9-0-1, 2.08, .894) certainly understands the rivalry. He was in goal for both of the Warroad games this winter and remains unbeaten on the year. He was also a key to the Prowlers’ third-place state tournament finish last year, the program’s first state tourney trophy since 1959. Narverud’s presence – and the team’s great defensive effort – will likely result in another low-scoring game Tuesday night against visiting East Grand Forks. Soderstrom and Odberg are the only two Prowlers with double-digit goals, although tough Evan Ose (7-10-17), Logan Engelstad (7-3-10), Connor Doherty (4-5-9) and Tanner Nessen (5-3-8) are capable offensive forwards. Defensively, Thief River Falls is strong with Chris Forney (1-7-8), Andrew Lansing (1-6-7), Grady Pederson (0-4-4) and Riley Olson (1-2-3) anchoring the unit. Meanwhile over on the East Side, the Green Wave needed overtime to beat the Warriors 3-2 on Dec. 16 in the teams' first meeting. East Grand Forks also required a massive game from senior leading scorer Zack Lawdermilt (21-16-37), who racked up all three goals as his team rallied from a 2-1 deficit. The Green Wave play a second game at Warroad on Feb. 4. East Grand Forks is unbeaten against Class A opponents this winter, as its five losses have come against Bemidji, Moorhead, Roseau and twice to Grand Forks Red River (N.D.), but this will be its first meeting against Thief River Falls, the defending section champion. Lawdermilt,who is on track to set school records for goals and points in a season, leads a high-scoring first line which also includes Andrew Gregoire (3-4-7) and junior Tommy Hajicek (4-13-17). Their speed and puck skills have powered the Green Wave all season. Tyler Hajicek (15-6-21), Kolton Aubol (10-9-19), Nick Korynta (5-11-16), Cory Mack (3-9-12) and Dixon Bowen (3-6-9) also provide offensive firepower. The growth of the Green Wave’s defensive corps has certainly helped the team to its fast start. After losing star defenseman Gage Ausmus to the U.S. National Team Development Program before the season’s start, the blue liners were thought to be East Grand Forks’ potential weakness. Instead, they’ve been very solid. Sophomore Colton Poolman (2-8-10) has been a revelation and is joined by Hunter Mero (2-5-7), Cole Peterson (0-5-5) and Eddie Eades (1-4-5). The Green Wave also has a veteran goaltender in senior Hunter Aubol (10-4-1, 2.35, .897). Another week, another great Lake Conference game between two teams on the rise. No. 5AA Edina (14-3-0) upset No. 1AA Minnetonka in its only game last week and has a great young team led by sophomore Connor Hurley (13-17-30) and freshman Dylan Malmquist (14-9-23). The Hornets have also been getting stellar goaltending from junior Willie Benjamin (11-3-0, 2.23, .914), who like the Hornets has only been beaten by No. 4AA Maple Grove (twice) and Minnetonka. No. 8AA Wayzata (11-4-1) upset No. 9AA Eden Prairie last week and seems to be finding its way after a slow start. The Trojans have won four straight games, the last two on shutouts by senior goalie Alec Almquist (10-2-1, 1.64, .918). Wayzata isn’t loaded with high-scoring players, but will play a tight-checking, disciplined game. The biannual match-up between the two best teams in the Classic Suburban will be played this Thursday night. No. 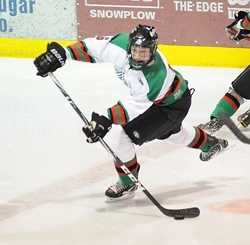 10AA Hill-Murray (10-5-0) has been rising since slipping out of the rankings earlier this winter, while No. 2A St. Thomas Academy (11-4-0) knocked off No. 3A Breck on an overtime winner from freshman Tom Novak (8-9-17) last week to perhaps reclaim the favorite’s status in Class A (with apologies to No. 1A Hermantown). The Pioneers got the better of the Cadets in their first meeting way back on Dec. 10, scoring twice in the third period to rally for a 2-1 victory. Leading scorer Jake Guentzel (8-18-26) assisted on both Hill-Murray goals and John Dugas (7-4-0, 2.61, .904) made 35 saves in goal. These two powers have been battling it out in both the Northwest Suburban Conference and in Section 5AA for the past several years. While No. 4AA Maple Grove (15-1-2) has had the edge in the regular season (and hasn’t lost a conference game since 2010), Blaine (11-5-0) has won six straight section titles, beating the Crimson in the finals the past two years. In their first meeting this winter, the Crimson posted a 6-3 victory on Dec. 8 behind a hat trick from senior Dylan Steman (16-18-34), who leads the team in scoring. Both squads enter the game off a disappointing effort their last time out. The Bengals endured a head-scratching 5-4 home loss to Champlin Park while Maple Grove tied Andover, 2-2. The results tightened up the NWSC race a bit, but one of these two teams is still expected to take the title. Another terrific Lake Conference game gets recognition in our top games of the week, as rising No. 8AA Wayzata (11-4-1) travels to Pagel Activity Center to take on No. 1AA Minnetonka (16-2-0), which has been almost unbeatable at home over the last five years (except when Edina comes to town). After losing Thursday night to No. 5AA Edina – a rare home loss – the Skippers reasserted their home-ice dominance with a 9-3 rout of former No. 1 Duluth East on Hockey Day Minnesota. The Skippers were flying, particularly Max Coatta (19-20-39), who racked up four goals – all on assists from linemate Vinni Lettieri (20-28-48). The dynamic junior pair is 1-2 on the team in scoring. Goalie Matt Behounek (8-1-0, 2.37, .907) also stood tall with 33 saves on 36 Duluth East shots. Next comes a rematch that could lead to shuffling in the Class AA top 10 rankings. No. 6AA Benilde-St. Margaret’s (12-4-0) edged No. 7AA Moorhead (13-3-0) in the semifinals of the Hockey Holiday Classic in St. Louis Park – a game that was tied until senior power forward Jake O’Borsky (11-12-23) scored with 1 minute, 18 seconds left. Junior – and Wisconsin recruit -- Grant Besse (21-25-46) added an empty-netter with one minute remaining. They lead a very potent Red Knights’ offense that averaged 7.7 goals per game and has six players with double-digit goals. Yet Moorhead actually outshot the Red Knights 30-29 in the first meeting. The Spuds have been getting a breakout season from junior twins Tony Uglem (16-6-22) and Nick Uglem (10-11-21). This game has annually signaled the No. 1 seed in Section 8AA (they’ve represented the section at state every year since 1996), but may not this year. No. 7AA Moorhead (13-3-0) has a big leg up on the top spot after already beating Bemidji, Brainerd and Roseau. The young Rams (9-5-1) were just beaten by Brainerd and Bemidji and need a victory badly after losing to the Spuds 5-2 on Dec. 15 at home. Roseau does have a team to watch, though, with a terrific cast of young players leading the way to the future. Sophomores Alex Strand (20-21-41) and Zach Yon (17-19-36) pace the Rams in scoring and are among the top-scoring players in the state in their class. Strand scored the only two Roseau goals in the first game against Moorhead and has seven multiple-goal games in his first 15 varsity contests. A study in contrasting styles should be in order in this inter-conference tilt. No. 9AA Eden Prairie (11-4-1) is playing it much closer to the vest this year with lower scoring games than in the heyday of its “Rau years.” But the Eagles are still winning with the new generation of players such as juniors Mason Bergh (9-19-28) and Andrew Knudsen (12-14-26) and sophomore Steven Spinner (12-9-21). On the other bench, Lakeville South (9-6-0) likes to open up the ice with University of Minnesota-bound Justin Kloos (22-28-50), Alex Harvey (16-16-32) and company. It should be a fun study in contrasting styles between teams that could very well make it to the X in March. Could this be the final signal of a changing of the guard in the Missota Conference – at least for this season? Chanhassen (12-3-0) has already beaten Holy Angels (6-5 on Dec. 15) and is a perfect 7-0-0 in the conference, while the Stars (4-12-1) are in fourth place. A big 9-2 loss to Lourdes just ended an eight-game Storm winning streak, however. Chanhassen has been paced all season by its high-scoring duo of Connor Kelly (20-13-33) and Nate Traina (12-17-29), while goaltenders Harlin Paradise (6-1-0, 2.32, .904) and Erik Anderson (6-2-0, 2.43, .912) have had plenty of support from an underrated defensive corps. Holy Angels has been searching for consistency from a young team in coach Greg Trebil’s last season. The annual battle for supremacy in Section 2A has been dominated by No. 3A Breck (13-2-0) recently, but the Mustangs have lost twice in their past four games (at Moorhead and to St. Thomas Academy) and could be reeling. Blake (11-6-0) meanwhile, has won six of its last seven games with sophomore Spencer Naas (21-14-35) on a serious hot streak. He has five multiple-goal games in the last seven and 14 goals total in that stretch. Both teams are also a perfect 5-0-0 in the Tri-Metro Conference. Breck has greater scoring depth, with five players in double-digit goals, led by Grant Opperman (17-22-39), Weley Iverson (17-15-32), Thomas Lindstrom (16-17-33), Conor Andrle (14-25-39) and Matt Colford (12-21-33).